Watercress, a leafy green plant that likes to grow in moving water, adds spice to your salads and meals with its crisp, tangy flavor. Fresh watercress is available at many grocery stores, and it thrives when placed in a container of water. If you start watercress from seed, the seedlings grow in soil until they are large enough to transplant into water. If you change the container's water regularly, you can keep watercress on hand in your own kitchen or garden. Germinate the watercress seeds if you prefer to start the plant from seed. Wet a paper towel and spread the watercress seeds across it. Moisten the paper towel daily. If desired, put the paper towel in a sealed bag to keep it moist. Wait for the watercress to germinate; this normally takes about 10 days. Once the watercress has germinated, fill 3-inch pots with potting soil. Sprinkle several germinated watercress seeds on the soil in each pot. Barely cover the watercress seeds with soil. Keep the soil very moist. In three weeks, the seedlings will be large enough to move to the water. Fill a bucket halfway with cool, clean water. Carefully remove the watercress plants from the soil and place them in the water. The watercress will continue to form roots in the water. Replace the water in the bucket every day. Watercress requires clean water to thrive. 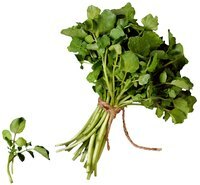 Cut the leaves off watercress plants to harvest them, but leave the roots. The leaves grow back, allowing you to harvest again. If you have your own stream, place mature watercress plants in the soil on its banks. Avoid planting watercress in garden ponds, where the water is usually stagnant and unclean.